A 5-inch gun on the USS Hornet. 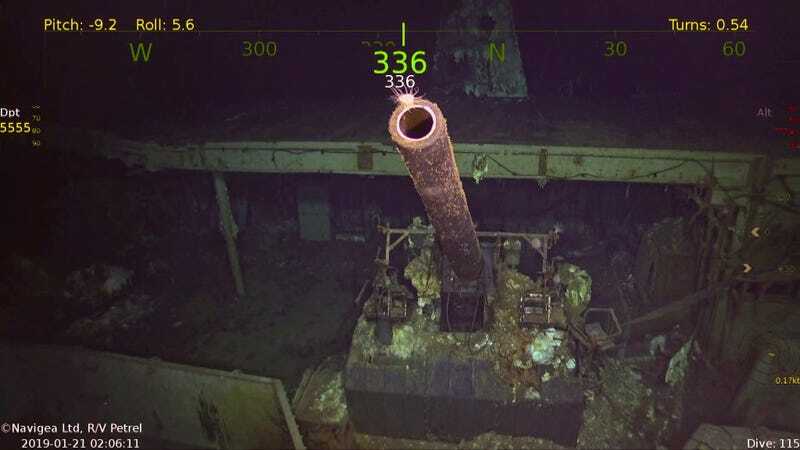 After 77 years, the wreck of the USS Hornet has finally been found, lying more than three miles deep in South Pacific waters. The storied aircraft carrier—sunk by Japanese torpedoes in 1942 with the loss of 140 men— played a critical role during the Second World War, most famously in the Doolittle Raid and the Battle of Midway. Vulcan Inc., an exploration team financed by the Paul Allen estate, discovered the sunken American aircraft carrier near the Solomon Islands in late January, CBS reports. Crewmembers aboard the RV Petrel used a deep-sea sonar drone to detect the ship 17,500 feet (5,330 meters) below the surface. The USS Hornet in October 1941. A remotely operated underwater vehicle (ROV) was then sent down to investigate further, confirming the wreckage as belonging to the Hornet, which it did by spotting its naval designation, CV-8. The Hornet went down during the Battle of Santa Cruz Islands in 1942 after a fierce fight with ships and planes from the Japanese Imperial Navy. A hole in the hull of the sunken aircraft carrier. Videos taken by the ROV showed the aircraft carrier’s 5-inch guns still pointing upward, along with a gaping hole in the ship’s hull. Incredibly, an aircraft tug can still be seen sitting upright—a scene that’s all the more unbelievable given the ship plummeted some 3.3 miles before settling on the seafloor. An International Harvester aircraft tug still resting upright on the ship. The discovery of the USS Hornet is a big deal, given its storied role during the Pacific campaign in the Second World War. On April 18, 1942, sixteen B-25 Mitchell bombers took off from the deck of the Hornet to participate in the legendary Doolittle Raid—the first airborne attack on Japanese cities, including Tokyo. The air raid served as a serious wakeup call for the Japanese military and its civilians, who falsely assumed such attacks were impossible given the reach of its Imperial Navy at the time. Two months later, the Hornet played a critical role at the Battle of Midway—a decisive victory for the the U.S. during the early stages of the Pacific campaign, and just six months after the shocking Japanese attack on Pearl Harbor. The Hornet under attack by Val bombers during the Battle of the Santa Cruz Islands. When Hornet and Enterprise were just north of the Santa Cruz Islands, search aircraft from the opposing forces found each other’s main fleet. Within ten minutes, Hornet was hit by four bombs and two torpedoes, and sustained significant damage from two Val dive bombers [Japanese Type 99 Aichi D3A1 dive bombers] that crashed into her. Hornet lost her propulsion capability and was dead in the water. After most of the crew was transferred from the ship, a damage control party put out the fires and repaired some of the damage. Later that afternoon, she was attacked again and hit by another torpedo and two bombs. At this time, she was abandoned and sank early the next morning—one year and seven days after being commissioned. Some 140 sailors were killed before the ship sank, but because orders were given to abandon the listing aircraft carrier, 2,060 sailors out of the ship’s 2,200 were saved. Dead in the water, the abandoned USS Hornet shortly before it was sunk. This latest find by Paul Allen’s team marks another important discovery in its ongoing mission to chronicle the locations of Second World War wrecks in the Pacific Ocean. Previous missions have uncovered the sunken remains of the USS Juneau, the USS Lexington, the USS Indianapolis, and many others. “We had the Hornet on our list of WWII warships that we wanted to locate because of its place in history as a capitol carrier that saw many pivotal moments in naval battles,” Robert Kraft, director of subsea operations for Vulcan Inc., said in a statement. “Paul Allen was particularly interested in aircraft carriers so this was a discovery that honors his memory.” Allen, cofounder of Microsoft, died of cancer in October 2018. The exact location of the USS Hornet will remain a secret, and the site designated an official war grave.